It’s been a long time coming but it’s almost there. 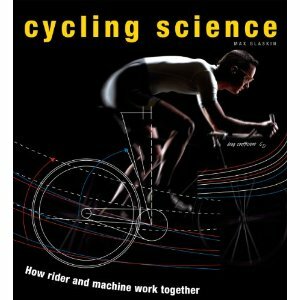 In 25 days my book on Cycling Science is due to be published. It occupied me for almost a year and, at times, it was not a comfortable journey. Finding science relevant to cycling that can also be illustrated with detailed infographics was a new challenge for someone used to dealing only with words, not illustrations. For instance, how can inertia, a fundamental influence on cycling, be illustrated clearly and easily? If you have an answer, please do send it via the Comment option below. Nevertheless, by scouring the academic journals it was possible to pull together several hundred pieces of research that deserved to be explained clearly in words and graphics so that cyclists can understand better how they work with their bikes. Some of the science and data may be familiar to the keenest but the book covers such a wide spectrum, from environment and physiology to aerodynamics and technology that it’s likely more than 90% will be new information to most readers. I finished work on the book in July 2012, after which my editors (seven at the last count) spent some time preparing it for printing. So I haven’t yet seen it and wait expectantly and nervously for the first advance copy. Although there is a pile of early page layouts stacked at the end of my desk, I know that whole spreads may have changed entirely and many, many tiny details tweaked. This blog is an open continuation of the book. There are items of science research relevant to cycling that are published almost daily somewhere in the world. I’ve been tweeting them (@cyclingscience1) as often as possible so that they become known to an audience outside the universities and research labs. Every so often I add a short item to my Facebook page (Cycling Science). This blog, thouygh, is meant to broaden the conversation, to receive feedback about the book, to hear directly from scientists and to disseminate and discuss the latest findings. If it works, it should be a lively read. If it doesn’t, well, I’ll just get on my bike and I’d suggest that you do, too. This entry was posted on 08/10/2012 at 1:49 pm and is filed under Uncategorized. You can follow any responses to this entry through the RSS 2.0 feed. You can leave a response, or trackback from your own site.